Description: What does it mean to have the mind of Christ? 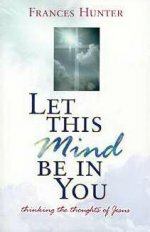 Within the pages of this book, Frances Hunter brings us a wonderful revelation of the transforming power that is ours as we learn to think the thoughts of Jesus. As we share in His thoughts, we become energized and empowered in every area of our lives, and our desires become His desires. But the choice to change is yours. Satisfy the deep yearning within for more. Just say yes to Jesus and experience the daily power and blessings of having the mind of Christ.